Domestication of animals and a rise in farming spurred the evolution of milk products, and humans adapted accordingly. Early protein remnants in clay vessels have been found in present-day Romania and Hungary dating back more than 7,000 years and attesting to the presence of dairy farming. Farms in England of 6,000 years ago give evidence of yogurt, butter and cheese production. Romans used goat and sheep milk for cheese, and Germanic and Celtic tribes drank abundant quantities of fresh milk from cattle. As populations migrated, this genetic trait became more widespread. And while eggs and milk became household staples, varying in use at times according to availability and cost, eggnog as such entered the scene around the 17th century in East Anglia in England. The term “eggnog” can be traced to “nog,” which was a strong beer, and a “noggin,” which was the small cup or mug from which one could drink the beer. Most culinary anthropologists trace the modern eggnog recipe back to a posset, a late medieval drink made up of eggs, hot milk and wine flavored with whatever spice was available. Because of the expense of eggs and milk, eggnog remained the drink of the upper class in England through the 18th century, while egg-based drinks became quite popular in the American colonies where milk and eggs were plentiful. As well, rum from the Caribbean was more affordable for the colonists than the heavily-taxed spirits of England. So eggnog is not merely a drink, but a testament to human evolution and adaptation. And just as man has evolved, so has eggnog. For aficionados of this seasonal treat, there are many recipes that all seem to compete for the title of the creamiest, frothiest and richest concoction. 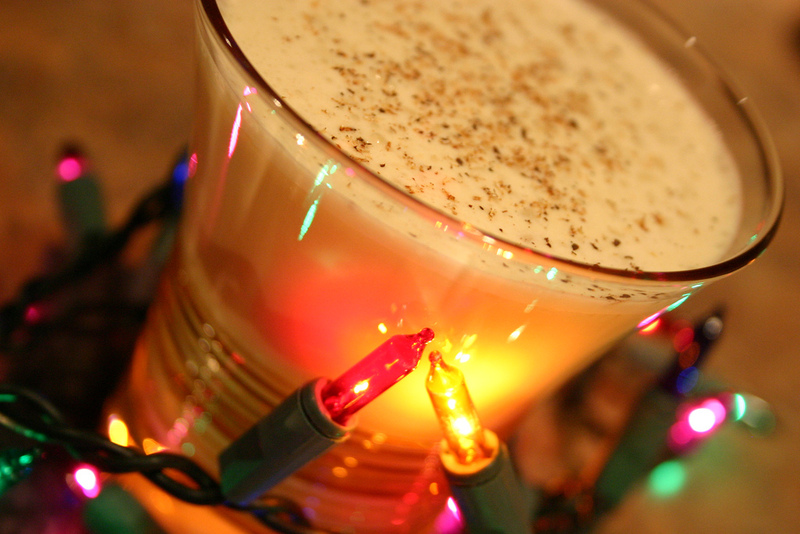 Here’s a recipe that does eggnog truly proud. This entry was posted in Biology, Blog, Bon Appetit Wednesday, Culinary, Culture, Holidays, Public Life, Science and Technology and tagged ancient history, AntiquityNOW, Balkans, Eggnog, genes, holidays, lactase persistence, lactose intolerance. Bookmark the permalink.